Tyrone manager Mickey Harte has made eight changes from last weekend's opening win over Armagh for Sunday's Dr McKenna Cup game against St Mary's. Rory Brennan, Dwayne Quinn and Cathal McShane will make their first starts after being handed debuts as substitutes last weekend. McShane replaces suspended Colm Cavanagh in midfield. Mark Donnelly and Connor McAliskey are among the inclusions in attack with Sean Cavanagh and Kyle Coney left out. Michael O'Neill replaces Niall Morgan in goals with Plunkett Kane and Patrick Quinn also drafted into the starting line-up. 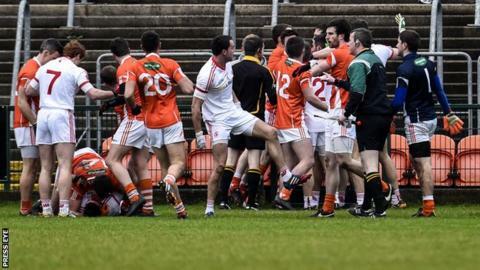 For Sunday's other Section C game, Jamie Clarke has been named at left half-back for Armagh's tussle with Antrim after coming on as a substitute against Tyrone last weekend. Matthew McNeice will start in goal in place of Niall Geoghegan who suffered an ankle injury against Tyrone. Antrim manager Frank Fitzsimmons makes three changes from the opening win over St Mary's College with goalkeeper Chris Kerr, Owen Gallagher and Michael Magill replacing Gerard Walls, Benny Hasson and Colm Fleming. Derry manager Brian McIver has handed debuts to Liam McGoldrick, Sean Brady and Niall Loughlin for their game against Fermanagh at Brewster Park. In all, the Derry side shows eight changes from the win over Donegal with Thomas Mallon, Mark Craig, Sean Leo McGoldrick, Benny Heron and Daniel Heavron all drafted in. Eoin McNicholl, Declan Brown, Conor McAtamney, Ciaran McFaul, James Kearney, Enda Lynn and Barry McGoldrick all drop to the bench while Emmet McGuckin is unavailable as he has returned to college in England. Donegal have named a more experienced line-up for their game against Queen's after their hammering by the Oak Leafers last weekend. Paddy McGrath, Declan Walsh, Frank McGlynn, Christy Toye and Odhran MacNiallais are all included after missing last weekend's defeat. The Section A action will begin with Saturday evening's contest between Cavan and Ulster University, Jordanstown at Breffni Park. Terry Hyland's Cavan side opened their McKenna campaign with a comfortable victory over Down last weekend while the students were narrowly defeated by Monaghan. Tyrone: M O'Neill; A McCrory, R McNamee, C McCarron; R Brennan, D Quinn, P Harte; C McShane, P McNulty; M Donnelly, D McCurry, P Kane; P Quinn, C McAliskey, S McGuigan. Subs: N Morgan, S Cavanagh, K Coney, P Hughes, T McCann, E McKenna, N McKenna, R McKenna, Justin McMahon, B Tierney. Armagh: M McNeice; M McConville, B Donaghy, M Murray; M Shields, F Moriarty, J Clarke; A Findon, S Campbell; S Forker, M McKenna, E McVerry; O Mac Iomhair, C Rafferty, N McConville. Antrim: C Kerr; M Kane, C Burke, C O'Rawe; J Laverty, D Lynch, P Mc Aleer; J Carron, O Gallagher; C Murray, CJ McGourty, D McAleese; C Johnson, Mich Magill, E McNeill. Derry: T Mallon; O Duffy, N Holly, J O'Kane; K Johnston, L McGoldrick, B Og McAlary; M Lynch, M Craig; SL McGoldrick, S Brady, B Heron; N Loughlin, D McKinless, D Heavron. Subs: E McNicholl, D Brown, B McGoldrick, C McAtamney, C McFaul, J Kearney, E Lynn, T O'Brien, N Toner, C Murphy. Donegal: M Boyle; C Parke, Eamonn Doherty, P McGrath; C McGinley, Declan Walsh, F McGlynn; M McElhinney, C Toye; Corey Gallagher, O MacNiallais, E McHugh, D McLaughlin, H McFadden, M O'Reilly. Subs: MA McGinley, J Gibbons, S Hensey, E Ward, Eunan Doherty, C McCaughey, G McFadden, D Molloy, R Melley, M McDermott, W Gillespie.